Posted January 23, 2019 by Sarah Lederle & filed under . 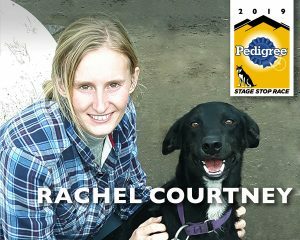 Rachel Courtney of Caliento, Manitoba was born in Germany and moved to Canada at 18. She describes herself as becoming “hooked” on mushing at the age of 14. She and her husband started their own kennel in 2012. How long have you been racing already? Why did you choose the Pedigree Stage Stop Race? I was always interested in running the SS although with the longer stages in previous years it was very hard to get my team ready in time for that kind off mileage due to warm temperatures we have in the Fall, which means often consistent training doesn’t start ’til middle of October. Now that the stages have been shortened it is interesting because it’s the usual distance we prepare for in a season. What I have heard from mushers that have raced this race before I have only heard great things, a very professional race, very competitive field off mushers and the scenery is just gorgeous. I am very excited to have the opportunity to race the 2019 SS. When did you begin your trek to Wyoming? We started on the 15 of January. About 1800 km, we started in Manitoba, Canada. Did you arrive early to acclimate to elevation? If so, where are you training? Yes, about 10 days to get the dogs used to the elevation here. We are currently training north of Bondurant, WY. How have pre-race training conditions been? Did you have good snow, no snow, too much snow, based on where you live/train? Most of the training was with ATV due to lack of snow. Just before Christmas we had enough snow to switch on sleds, but it was never a lot of snow. When do teams start their training? I started training late September, it was to warm this year to start earlier. What is your training schedule like 2 weeks before the race? 1 week before the race? Real short runs just to get the dogs adjusted to the altitude, 10 to 17 miles. Thanks Rachel, we’ll see you soon!